Those are beautiful! Remind me, did Tuscan Red mean a loco was designated for passenger service? As noted, PRR colors and paint schemes were standardized. Locomotives were painted in a shade of green so dark it seemed almost black. The official name for this color was DGLE (Dark Green Locomotive Enamel), though often referred to as "Brunswick Green." The undercarriage of the locomotives were painted in black, referred to as "True Black." 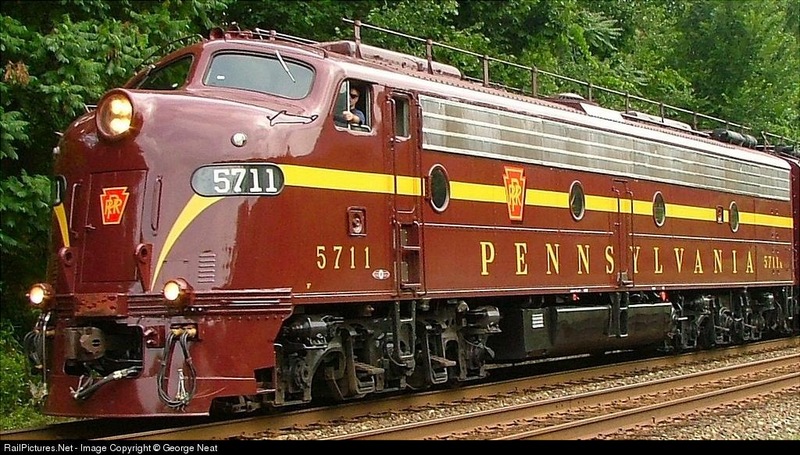 The passenger cars of the PRR were painted Tuscan Red, a brick-colored shade of red. Some electric locomotives and most passenger-hauling diesel locomotives were also painted in Tuscan Red. Freight cars of the PRR had their own color, known as "Freight Car Color," an iron-oxide shade of red. On passenger locomotives and cars the lettering and outlining was originally done in real gold leaf. After World War II the lettering was done in a light shade of yellow called Buff Yellow. While being disappointed watching the Ryder cup at out team's pathetic performance and then being disappointed by my Cubbies failure to generate a offense I at least accomplished something here. Let there be stripes! Edit: My bad. Semi-old post. Didn't see the last post was from a few weeks ago. The best we could do is simply paint on the numbers. This one is in the library now.